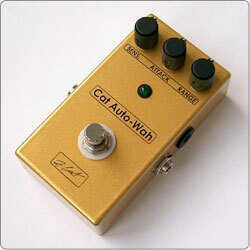 This Pedal is an envelope filter that produces an Auto-Wah effect that is interactive with the play dynamics. It has three knobs Sensivity, Range and Attack. With Sensivity knob you can adjust the effect response to the dynamic of the input signal, Range knob allows you to adjust the depth of the Wah effect and with Attack knob you can set the response time of the effect.